1. On the basis of the psychological tests, for all and each of the visionaries it is possible with certainty to exclude fraud and deception. 2. On the basis of the medical examinations, tests and clinical observations etc, for all and each of the visionaries it is possible to exclude pathological hallucinations. 3. On the basis of the results of previous researches for all and each of the visionaries it is possible to exclude a purely natural interpretation of these manifestations. 4. On the basis of information and observations that can be documented, for all and each of the visionaries it is possible to exclude that these manifestations are of the preternatural order, i.e. under demonic influence. 5. On the basis of information and observations that can be documented, there is a correspondence between these manifestations and those that are usually described in mystical theology. 6. On the basis of information and observations that can be documented, it is possible to speak of spiritual advances and advances in the theological and moral virtues of the visionaries, from the beginning of these manifestations until today. 7. On the basis of information and observations that can be documented, it is possible to exclude teaching or behavior of the visionaries that would be in clear contradiction to Christian faith and morals. 8. On the basis of information or observations that can be documented, it is possible to speak of good spiritual fruits in people drawn into the supernatural activity of these manifestations and in people favorable to them. 9. After more than four years, the tendencies and different movements that have been generated through Medjugorje, in consequence of these manifestations, influence the people of God in the Church in complete harmony with Christian doctrine and morals. 10. After more than four years, it is possible to speak of permanent and objective spiritual fruits of movements generated through Medjugorje. 11. It is possible to affirm that all good and spiritual undertakings of the Church, which are in complete harmony with the authentic magisterium of the Church, find support in the events in Medjugorje. 12. 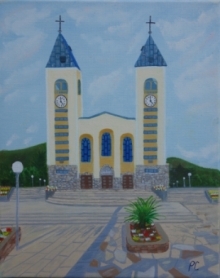 Accordingly, one can conclude that after a deeper examination of the protagonists, facts, and their effects, not only in the local framework, but also in regard to the responsive chords of the Church in general, it is well for the Church to recognize the supernatural origin and, thereby, the purpose of the events in Medjugorje. So far it is the most conscientious and the most complete research of the Medjugorje phenomena, and, for that very reason, it is the most positive that has yet been said about it on a scientific-theological level.